I've been busy lately. As usual I have a lot of side projects going on. This is mostly because I have many interests and I always like to be creating things. Well, it has been two years, so lots! My last post was about the release of my indie iOS, Android and now web game OddBalls. From there, I started a new job as the Lead Developer of a new game studio in town called TinyMob Games. We made a mobile game and released it: Tiny Realms. We are also working on a new unannounced prototype right now that is shaping up really great! Meanwhile, I've also joined a meet up group of board game designers and have been developing some board games. 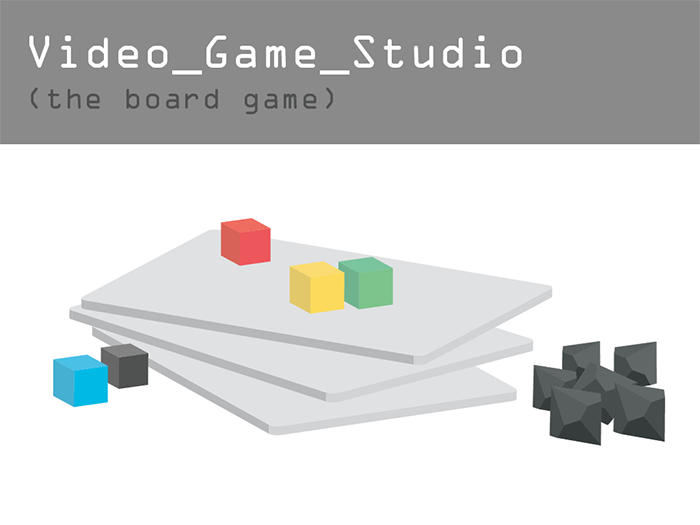 One of those games, Video Game Studio - the board game, is a game I designed and developed with my friend Ben Hesketh. As the title suggests, it's a board game about running a video game studio. It's a Euro style game about managing company resources (employees, work, business deals) and trying to make more successful video games than your opponents. It has many meta jokes about the industry and has turned out to be really fun. It's also been nominated as a finalist in the Canadian Game Design Awards (the winner will be announced at FallCon in October). We hope to release the game publicly in the future. So that's cool. I have also been working on a new indie video game entitled Elemancy. It is an adventure strategy game. Think of it like a mix of Zelda and Triple Triad (a card game). Essentially you adventure around in a big magical world centered around the main elements. Each faction identifies with the elements of a certain colour (so the blue faction focuses on the elements of air and water, red focuses on earth and fire, etc). As you explore this world you will need to battle enemies and this is done on the "elemental plane". In battles the game becomes a strategy card game about the elements and alchemy. You will start the game as a blue elementalist, but you'll also learn to use the powers of the other three main colours. The story, world and mechanics all tie together with this overarching theme of the elements which acts as a metaphor at the heart of the game. As it sounds, this game is pretty hefty to make and I am still in the early stages of development - but it's going quite well! What else? In the last two years I've also done some travelling and visited New York, Mexico, France, Spain, Boston, Seattle, San Fransisco, the Okanagan and a few other places. I've been busy :). So What Updates Can We Expect? I hope to start posting more about the development of my game Elemancy. I will also post updates about the board games I am making (like my press-your-luck deck building dungeon crawling card game called King's Hero). And there will always be some other updates about other things going on in my life. For instance, next weekend I am hosting Victoria's premier 48 hour game jam OrcaJam for the 3rd year in a row. If you are interested in making video games I highly recommend you come out and meet a bunch of like-minded folks and make some games with us! Firstly, Congratulations for the good work. We are a group of Music Fanatics, we've been listening to your mixes ever since the release of the first episode. When can we expect another new episode (Home with House Podcast). We really love your music!